Chennayil Oru Mazhaikalam wishes all its well wishers a Happy New Year. While Northeast Monsoon officially ended on 31st December 2014 the winds would continue to be Easterlies till about April possibly with occasional winter rains during this period. Its time to enjoy our winter and the early morning nip. The Northeast Monsoon 2014 was a mixed bag. The rainfall was irregular, very heavy bursts when it occurred, with no established pattern. 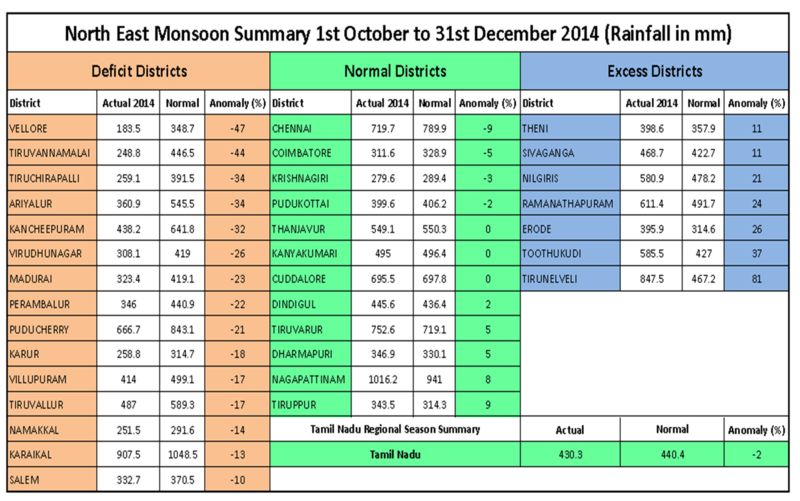 Central Interior Tamil Nadu & North Tamil Nadu has received lesser than normal rainfall. South Tamil Nadu received excess rainfall. Some of the highlights of this season are. The period between October & December 2014 saw two Very Severe Cyclones, Hudhud which struck Vishakapatnam & Nilofar that wandered around aimlessly in Arabian Sea. Overall 19 districts received lesser than long term average this NEM season.